Welcome to Eby Beefalo Co. located in Powell Butte, Oregon! When you are sitting in the middle of a community with black bulls and cows in almost every field why would one even consider raising the Beefalo breed? When the breed is mentioned the neighbors look at you with question in their eyes. They vision the animal breaking through the fences running wild down the road causing havoc along the way. So why Beefalo? Why not raise livestock that calve easily, are docile and friendly, less expensive to feed, and produce quality lean, low cholesteral meat? And at the same time being a well portioned beautiful animal. When the calves are born you never know what the color they will be and they usually are covered with wavy curls. But most of all it is just a joy to watch the cows each day, wait for them to birth and watch the little ones mature. The Beefalo breed is becoming more popular especially since the public is realizing how important it is to be health conscious. The Beefalo Breeders of the Northwest lists the beefalo breeders located throughout Idaho, Oregon, Washington, Western Montana, Northern Utah and Northern California. For additional information please visit their website at www.beefalonorthwest.com . 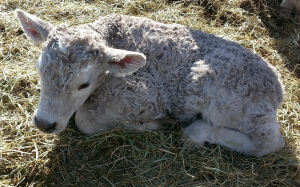 This website has been created for the viewer to become acquainted with the Beefalo breed and to read the story of how Eby Beefalo Co. came about. It is becoming a very rewarding journey! USDA tests prove that Beefalo has less cholesterol than chicken and less fat, cholesterol, and calories than traditional beef. Comparison of Beefalo, Lean Beef, Chicken and Cod. Copyright © 2018. All Rights Reserved. Eby Beefalo Co.